If you've got a hole in your plug-in folder that needs 'taping up', give VTape a try. Excellent saturation sound. Tailored EQ. Simple tap delay matrix. Tempo Delay function. Not cheap. Uninspiring to look at. Basic presets. VTape Delay has a step sequencer style tap matrix. VTape is designed to emulate the tape sound through two individual-but-related plug-ins: VTape Saturator and VTape Delay. Both share some features, such as three tape-related parameters (hiss, flutter and bias), input drive, output trim and metering, and some basic factory presets. But the other common feature, namely the 3-band EQ, serves a different purpose in each plug-in. In the Saturator it´s a straightforward EQ, but in VTape Delay it processes the feedback signal, enabling you to create complex, evolving delays. Of the three tape-style parameters, Hiss is the simplest, giving you level control of a noise generator. Flutter emulates the speed variations of tape with up to +/-2% variation, adding the modulation and thickening that´s possible with mechanical reel-to-reel devices. Finally, Bias affects the colour of the distortion and its harmonics, ranging from odd to even. It´s important, too, to mention that the input level also acts as the drive level for saturation. In the VTape Delay, the most striking aspect is the tap delay indicator. This is in 16ths, with separate left and right displays, and enables you to specify initial taps up to the one-bar point. This then combines with the delay parameters and, most notably, the feedback delay, which controls the feedback speed. Settings here can be synced if required, and in addition to the typical feedback amount and high frequency damping, there´s also a Rotation option and a Kill switch to instantaneously stop all feedback. The former is a speed control for a stereo panner, and we found it great for ‘round the head´-type delays. With analogue tape, the benefits typically come from multiple tracks of subtle saturation. 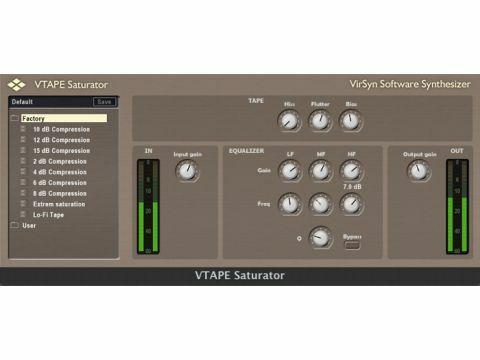 VTape Saturator works well when used with some caution on multiple tracks, or with a bit more aggression across a stereo mix. However, the plug-in can sound great at extreme settings too - simply using the input level to drive the effect can lead to tasty overload-style tape compression. Plus, the 3-band EQ seems capable of the ‘enhancing´ kind of equalisation that tape can yield. VTape Delay is definitely the more creative of the two plug-ins, and anyone used to EQing delay returns and feeding them back manually on a desk will love the option to heavily EQ the feedback signal. Common to both processors is the ability to assign MIDI controllers to parameters - this is particularly useful for VTape Delay, and means you can get hands-on control, for that full-on dub-delay experience. The VTape plug-ins may look unassuming and the factory presets are a bit basic, but the sound of them is what counts, and VirSyn has got this spot on. However, there´s already plenty of competition out there in this area of the plug-in market, and at over £100 for the pack (plus a Syncrosoft dongle), you may want to try the demo before you buy.